As the number of customers increases, not only your revenue but also your customer support requests go up. If you are just starting out, it’s not that big of a deal to handle all the customer support requests yourself as the business owner. But as the number of customers increases, the time it takes you to fulfill customer support requests will go up. Not only that, if you don’t optimize your customer support process, it will start costing you a ton of money to keep up with the requests. While hiring a customer support representative can help you spend less time on customer support, there’s a small number of people you can hire for customer support as a small-medium business owner. This is where having a Knowledge Base on your website comes to rescue. When your customers want a question answered, they will start looking for a contact button or create a support ticket. And when this happens, if you first ask your customers to search your knowledge base, your number of support requests will significantly go down. Most of your customer support requests will revolve around the same questions. And if you answer these questions in a Knowledge Base, not only will you be able to direct the customer to a more detailed answer but will also reduce the time you spend managing support tickets. Lowers the costs of customer support: You can only hire a few customer support representatives until you run out of cash. A Knowledge Base will help you reduce the number of support requests and will help bring down the costs of customer support. As the number of requests reduces, your cost for customer support will also go down. What without a Knowledge Base would need a whole team of customer support agents will be easy to manage yourself with a Knowledge Base in place. Happy Customers: It is not possible for you to instantly reply to each and every customer support request. When a customer doesn’t hear back from you in a few hours, they might get frustrated and even stop doing business with you. With a Knowledge Base, all the customers have to do is type a search query and they can get answers to their questions about your product instantly. Fewer support requests: A knowledge base can significantly reduce the number of support requests you receive. This will not only reduce your costs for support but will also reduce the amount of time you need to spend fulfilling customer support requests. Good for SEO: Your knowledge base answers the most frequently asked questions in your industry. It will help you get some free search traffic from Google. Not only that, it will also bring all the search queries with a question about your products directly to your site. Make your product easy to learn: When you have a knowledge base, all your customers have to do is search your knowledge base for whatever they want to learn about your product. It is considered a good practice to link to the pages in your knowledge base directly from inside of your products. For example, instead of hoping your customers find your knowledge base and searches for a question about your product’s settings, link to the knowledge base page that answers the questions about your product’s settings directly from the settings page of your product. Now that you know the benefits of a Knowledge Base, I will guide you through some of the easiest to implement solutions available. Some of these solutions are premium and offer an all-in-one solution. Others are free and offer limited functionality but get the job done. 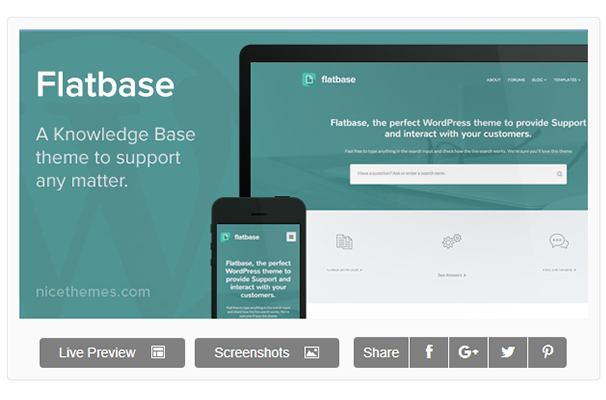 WP KnowledgeBase is a free plugin for WordPress that allows you to create a beautiful Knowledge Base directly on your WordPress site. It offers a clean, minimal design that is fully responsive. It comes with support for predictive text and live search results. Fully responsive design that looks great on all devices. Easily customize all aspects of the design within seconds. Support for live search and predictive text. Allows you to display a comments section below the Knowledge Base article. You can disable it if you want. As the name suggests, Ultimate FAQ is a free FAQ creator plugin for WordPress. It allows you to create a FAQ page on your website. Unlike other plugins and themes on this list, this plugin only offers a simple FAQ Page. Support for unlimited questions and unlimited FAQ Categories. Ajax-based Search Form that displays results without reloading the page. Allows you to easily export all the frequently asked questions to a PDF file to create a user manual. Allows you to easily customize the CSS of your FAQ Pages. Yada Wiki is a free Wiki plugin you can use to create a Knowledge Base on your WordPress site. This plugin is not a Knowledge Base plugin itself but can be used as one. It comes with dozens of customization options, so you can easily customize the design to suit your branding needs. Responsive design that looks great on all devices. A simple interface for managing your wiki pages. Dozens of customization options to help you customize the design. You can easily customize the design within seconds to suit your branding needs. Comes with support for Categories and Tags, so you can better categorize your wiki pages. KnowAll offers a beautiful design. It offers a responsive design that easily adapts to all screen sizes. This theme comes with dozens of customization features and allows you to customize all aspects of the design. This theme is translation-ready. You can easily translate it into multiple languages and create a multilingual Knowledge Base. Support for user-restriction allows you to lock the Knowledge Base and make it available only to your logged-in users. Comes with support for videos, so you can upload explainer videos, webinars, and screencasts. Responsive design that works on all devices. Flat Base is a Knowledge Base theme that offers a minimal flat design. This theme is fully responsive and looks great on all devices. It comes with all the features you will need to create the perfect Knowledge Base for your product. It comes with a bbPress integration to help you easily create a forum for free. This theme is fully customizable, so you can customize the design to suit your branding needs. Easily add an accordion-style FAQ section. Live Search that displays results as soon as the user starts typing. Offers a boxed as well as a full-width layout to choose from. Optimized for SEO, so you can get some search traffic to your Knowledge Base. Helper offers a clean, minimal layout that is fully responsive. This theme is fully customizable, so you can customize the design to suit your branding needs. It allows you to fully customize the color scheme, the layout, the typography and every other design element. This theme is translation-ready, so you can easily translate it into multiple languages and create a multilingual Knowledge Base for your customers. 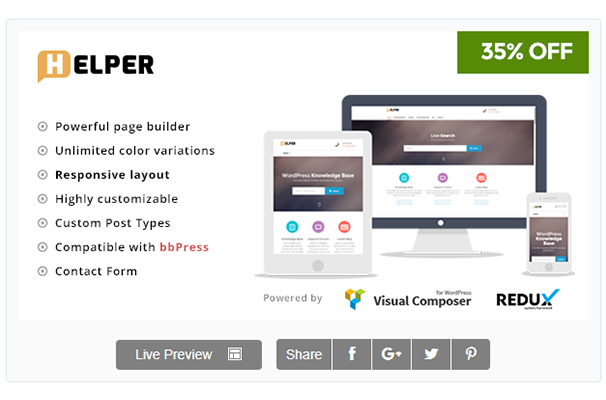 Comes with Visual Composer to help you build pages with a simple drag-and-drop interface. Offers a responsive design. This theme works on all devices no matter the screen size. Allows you to customize all aspects of the design. Customize everything from the color scheme to the typography styles and even the layout. Support for bbPress, so you can easily set up a forum on your website. 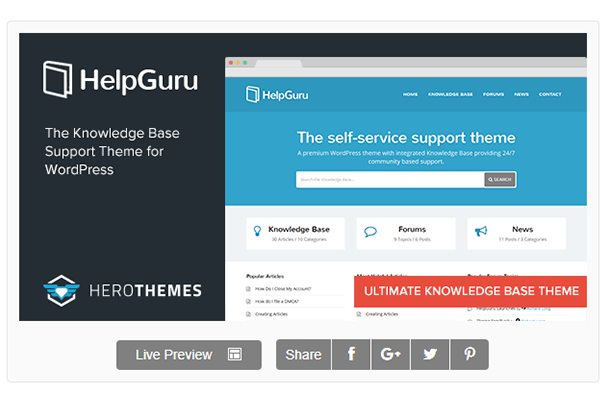 HelpGuru is one of the most popular Knowledge Base Themes for WordPress. It is used by popular brands like CrazyEgg, OptimizePress, and Procurify. Support for Live Search. Displays results as soon as the user starts typing. 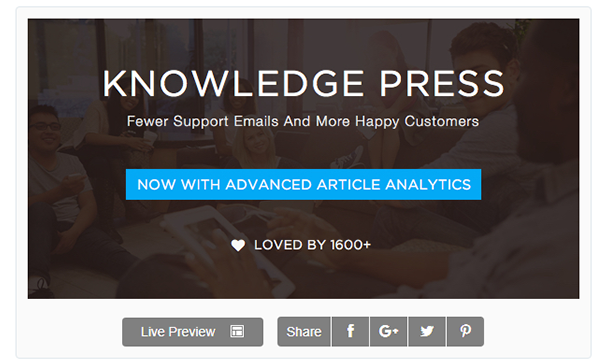 Allows you to collect feedback on the Knowledge Base articles from your users using like and dislike buttons. Reorder your articles and categories with a simple drag-and-drop interface. Comes with 3 sidebar widgets you can use to display Knowledge Base articles anywhere on your website not just on the Knowledge Base pages. Support for Article Attachments, so you can attach files like templates to your Knowledge Base articles. Responsive design that looks great on all screen sizes. Translation-ready, so you can easily translate the theme into multiple languages. KnowledgePress offers a beautiful design that is mobile-ready and works on all devices. This theme offers a distraction-free clean, minimal layout. It is fully customizable. So, you can customize all aspects of the design to suit your branding needs. Easily create a multilingual Knowledge Base and reach your customers in their native language. This theme is fully translation-ready. Reorder articles and categories with a simple drag-and-drop interface. Support for article voting allows customers to give you feedback based on likes and dislikes. Built-in Search and View analytics. No need to integrate Google Analytics. 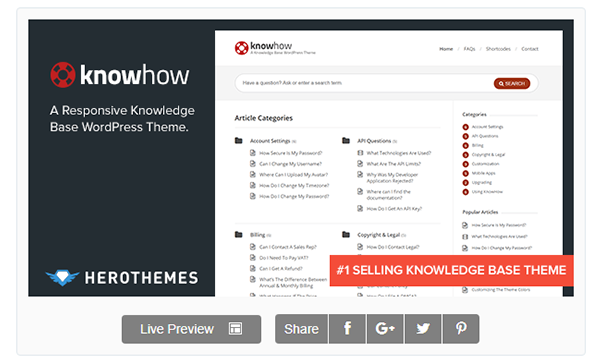 KnowHow is a SEO-optimized Knowledge Base WordPress theme. It comes with a clean, minimal layout and offers a beautiful design. It is fully responsive and easily adapts to all screen sizes. This theme is fully customizable. You can easily customize the design with just a few clicks to suit your branding needs. Support for Live Search to provide instant answers to your customers as soon as they type in their search query. This theme is SEO Optimized, so you will receive free traffic from search engines. Comes with a FAQ page you can customize and add all your frequently asked questions to. Translation-ready, so you can easily translate it into multiple languages and create a multilingual experience for your customers. 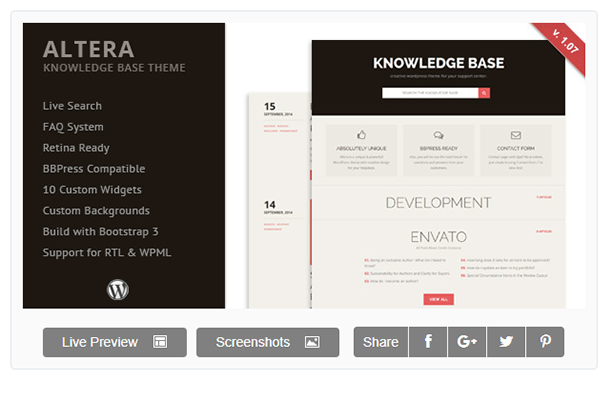 Altera is a fully customizable Knowledge Base theme for WordPress. It offers a clean, minimal layout and looks great on all devices. This theme is fully customizable. You can customize all aspects of the design to suit your branding needs. Minimal responsive design that looks great on all devices. Fully customizable. You can customize all aspects of this theme within minutes. Comes with support for Schema Microdata. This theme is SEO-ready, so you can benefit from free organic Search Engine traffic. Comes with Visual Composer, so you can easily build beautiful pages with a simple drag-and-drop interface. Having a Knowledge Base on your website can significantly reduce the number of support requests you receive from your customers. Not only that, it will also bring down your customer service costs. With a low number of support tickets, you won’t need to hire many (if any) customer support agents. If this article helped you find the perfect solution, please share it with your friends. And let us know what you think in the comments section below. Good list of resources. The one (Helpie) which i have used sometimes back is missing. Though i have used wordpress knowledge base, i made a choice to go ahead with SaaS based knowledge base after reading this post. I feel there are many gaps which i can see in the wordpress knowledge base theme like automation, tracking changes, commenting and integrations.